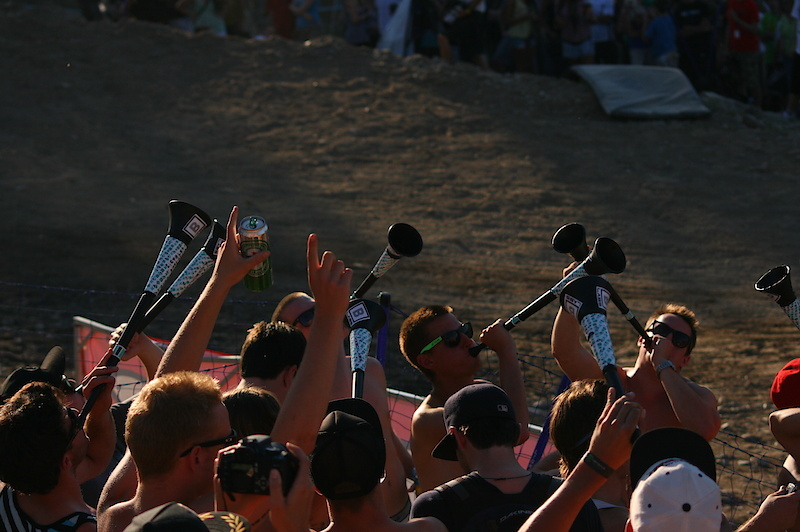 Myself, Eric Behn, and Adam Yunker (Spoked Media) teamed up this year to film the Monster Energy Slopestyle event at Kokanee Crankworx 2010. Here is the story, a final edit by Adam and some photos shot by Jaycee Clarkson and Alex Weber. Enjoy it all inside,This was my third year attending Crankworx and it was highly anticipated to be one of the biggest thus far. After a week of various races and competitions the main event was about to go down. The atmosphere was ecstatic and the village was packed with bike enthusiasts. The good weather that has been around all week stuck around for a super hot day. As the day got hotter, the free sunscreen and deodorant was flying out of boxes and the bikinis were showing up. Demo tents were busy as bikers got their last ride on the new 2011 Demo 8 II, the 2011 Giant Glory and other amazing bikes. Monster Energy was also there giving out drinks, this year you had to give a donation to get one, but a 25cent drink is always welcome in my eyes especially when its going to a good place. By the time practice had rolled around everybody had consumed a Monster drink and if you were lucky enough to find them, a Red Bull energy shot from the Cove Bikes' tent. At 2:00 me and Adam headed up to scope out the course and do some one course filming while we still could. Riders touched up their skills and worked on overcoming the fear of the massive judges tower drop and final jump. We took some shots at the whale tail before the course was closed to media, we didn't have the yellow wrist bands so we were limited to 5 media pods. I took the top half of the course while Adam took the bottom. Within half an hour herds of spectators began to fill the sidelines and prepare for an adrenaline rush. The lucky/smart ones found shade while the rest toughed it out for better spots. It was time for the event to start. Qualifying started with 2 rounds of 16 riders. Everyone put in runs, but the upset that shocked the whole crowed and anyone who knew anything about freeride. Branden Semenuk who was highly anticipated to be the winner by almost everyone in the bike community took his first run. Putting down the smoothest, cleanest and quite possibly best run of the day, Brandon took a huge fall on an under rotated back flip on the final jump. Hurting his neck and collar bone Brandon could not finish the competition. I along with many other spectators was choked, after talking with his mother and father the morning of the event I felt for Brandon and his family. I wish Brandon a quick recovery! Brandon was not the only injured rider. In fact three of the top riders: Brandon, Claw and Yannick were all out of the competition due to injuries. Many thought that the course was poorly designed with a drop much too massive to trick safely and a final jump which put each rider at risk. Even third place winner Casey Groves later expressed his feelings about how he wanted to see safer courses and better designers for 2011. On a positive note Groves said "I did have fun and learned that I never want to trick a drop that big and gnarly again because of how many of my friends got hurt!". With injured riders and broken bikes the "Super Finals" consisted of 5 riders as opposed to the 6 after Yannick got injured and could not complete the competition. Cam Zink put down a run early on that was unbeatable with a 95.0 score that kept him up top. Montgomery killed it again on the hard tale, but went down in his final run attempting a tail whip off the final drop putting him in second. The 18 year old Casey Groves lost his chain in his final run and took third keeping the Canadian crowd pleased! Here's the video of the event filmed by myself Eric Behn and Adam Yunker (Spoked Media), and some photos by Jaycee Clarkson and Alex Weber. At the end of the day stoked fans made their ways down the mountain in a cloud of dust, literally, and I made my way home. 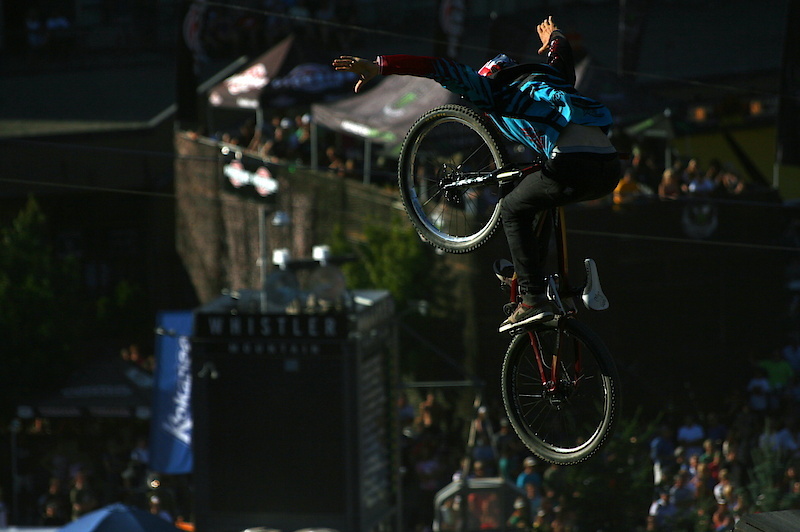 Another great event put on by the Crankworx team. Now it's my turn to go out and ride. Excellent to see Casey on the podium where he belongs,and it was good to read his inspiring words about how far to take things,he mentioned watching some of his best friends getting hurt trying to pull tricks,and of course himself getting hurt off that huge drop,nasty but we all know Casey's a fighter he'll just shrug off the dust and move on to the next comp. But his main point was that things could have gone a lot worse for him and others,by tricking and miscalculating that drop,better safe,as Casey as predicted the future courses should be like,than sorry.PROPS CASEY ON YA PODIUM.C.O.C will be over the moon and rightly so.They're were so many mint features at this Kokanee Crankworx,like the Monster bowl,what had 6 nice options on it,then that mini corkscrew thing that everyone was opposite 3'ing out of.But course designers need to under stand that these events are now slopestyle specific,not freeride specific like the Red Bull freighttrain event in Australia,and of course the Rampage,these are undoubtedley Freeride events.And drops should be designed with that in mind,and the bikes getting used in mind,and the number of falls by second to none riders.I'm sure once everything been put into perspective,a rule should be brought in where by the podium from the previous event has the choice of having a say in the design of the next course,after all they know they're limits.Obviousley put an obstacle in their that will have the riders talking among themselves and thinking of things to do on it.Anyway i've had my lecture,so now ya's can slate me or ignore me i don't mind. "FCUK FREE WORLD-:C.O.C!! !FCUK FREE WORLD-:C.O.C! !FCUK FREE WORLD-:C.O.C! !FCUK FREE WORLD-:C.O.C" Ha-ha-ha. Killer story and spectacular video!! Thank you!! Nice write up, vid, and pictures. Good job! such a friendly spectator course!! So sweet! the video is really good. I love how all the shots within the course and great angles on the features. what do you mean the course sucked, are you mad!!??? corsair must be stoked, how long has it been since hes been riding with them 6 months maybe. Kelly McGarry looked uber stoked for cam zinc, he was just sitting there with an ear to ear grin on the other side of the crowd when cam was getting his medal. 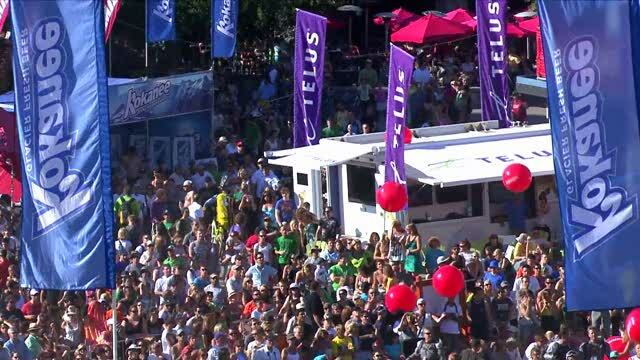 Was Brad Ewen announcing the event this year ?? That guy rocks !!! Awesome !! As much as some people don't like his style ... some do. Any classic lines .. "shut the back door" .. "how is the story going to unfold" .. etc. etc. I think Brad makes the event more interesting, but here all the announcers were excellent this time around. Really big drops or jumps just don't do it for me. They should make them smaller so the riders can safely bring the best they have. 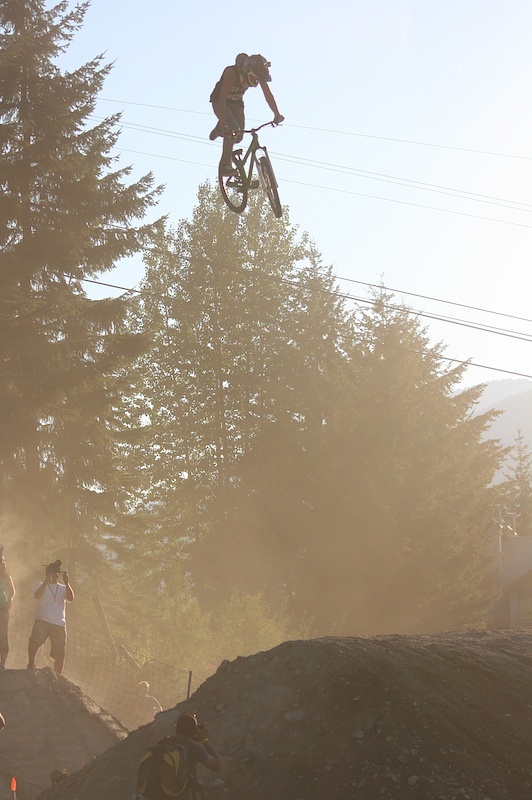 This is slopestyle not dirt jump they are riding MOUNTAIN BIKES! I'm super bummed riders went down especially after seeing the Claw and Semenuk's great runs but that being said.I would way rather see a huge 3 of a 20ft drop then a bunch of combo dj tricks on smaller features. 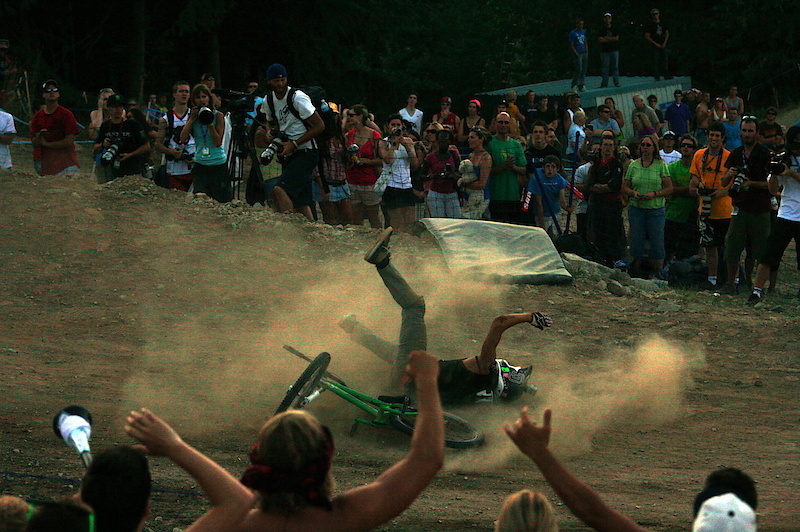 Leave that to BMX. Big wheels = big course. I was pretty much just talking about monster drop, the rest weren't over sized. What I'm saying is that you see more style when the jumps are not so huge.